Figure 7.4: A RGB representation of a color image. one to exploit this interpretation of the reflected spectrum. A color image and its decomposition into the three channels, red, green, and blue, is shown in Fig. 7.4. Of course, the given interpretation holds only approximately: The red channel is not the spectral response to red illumination, but the red part of the spectral response to illumination with white light. The RGB representation of a color fundus image is shown in Fig. 7.4. The red channel is relatively bright and the vascular structure of the choroid is visible. The retinal vessels are also visible but less contrasted than in the green channel (compare Fig. 7.4(b) with Fig. 7.4(c)). The blue channel is noisy and contains only few information. The vessels are hardly visible and the dynamic is very poor. color space depends on the age of the patient and on the yellowing of the cornea; the cornea can be understood as a filter that screens out ultraviolet radiation. With the age, the cut-off frequency moves toward the blue, and even blue light can no longer pass. This interpretation of the color content of fundus images privileges the use of the RGB color space, for the channels have a physical meaning. 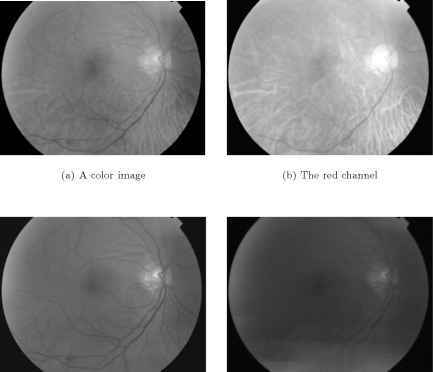 We have compared qualitatively the green channel of 30 fundus images with channels of other color spaces (HSV, HLS, Lab, Luv, principal components) and for all images, the green channel was better contrasted than any other channel (at least concerning all blood-containing features). Another advantage of the use of the green channel is that the choroidal vessels do not appear at all, whereas they do appear in the luminance channel for instance, for it is a combination of the three channels R, G, and B. This is why, we work mainly on the green channel.